Defining design in today’s digital era is not a very easy task, there are a lot of cross and connections of multiple disciplines that create new domains and forms of art. The conventional design shape can easily change or even evolved to a new shape and form. 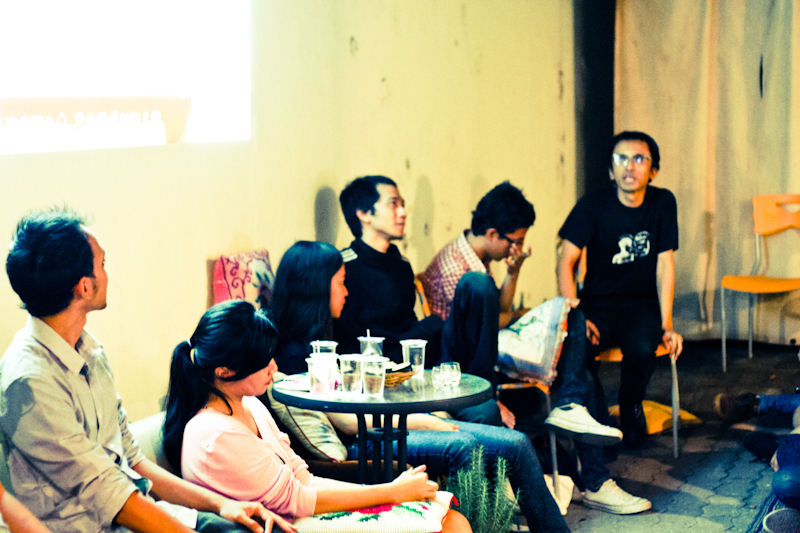 Benny Wicaksono, a seasoned player in the video art scene, also agreed with Ghubi. “Now, everyone has gadgets, we just have to direct them on how to use it. Everyone can create their own media. This is an art decentralization, this is democracy.” Benny also opined that there are just as many digital media artists in Surabaya as the other cities, it is only the creative atmosphere that hasn’t been fully developed. The current media development also has been responded interestingly by Kinetik, an alternative video makers community in Surabaya. Aditya Adinegoro, also called Remi, one of Kinetik’s member stated his interest in the little issues that have not received enough attention from the big media. “We’re here to document the little things in the daily life, because what is mostly considered as not important today will be considered as a history as well in the future,” said Remi. Kinetik itself is not working alone, they have built a network with Forum Lenteng in Jakarta who runs on the same vision. Up until today, Kinetik has created a lot activities that involve the mass citizens. For example, making a video about a boxing match in a rumah susun (rent control flats for the lower-income), the video art work of a narrated story in Kampung Ampel, to an alternative movie theatre for kampung people. “In essence, we would like to give an alternative option to what seem like a homogenous mainstream media. We work on small things that are not being captured by the corporate media. We are the media that grow and exist for the grassroot citizen,” said Remi. Writings, photography, and citizen journalism’s works that they made are then published in akumassa.org. Same as Kinetik, Phleg also created his music underground. A lot of people know Phleg by his stage name Terbujurkaku, an alter ego shaped as an underground digital musician. In his songs, Terbujurkaku prefers to make compositions that are closer to the mass, dangdut koplo. “People often think that dangdut music has no class, while abroad, dangdut is much appreciated. Dangdut is our root, it is here where I laid the foundation for my work,” said Phleg. Philosophically, Phleg also stated his opinion about the originality of the works of a digital artist. “By digging the values from our cultural roots, our work will stand out and different from the sea of other uniform works in today’s digital era,” said Phleg. The discussion was heating up when we touched the issue of ‘copy-paste’ culture and creative work’s plagiarism that are quite often these days. One of the discussion participant, Iman Kurniadi, a film lover and administrator of CinematicOrgasm twitter account said that the culture of plagiarism is unavoidable in this digital era. “At the moment, the important things is how you can be as original as you can be, or in other words, make it hard for other people to imitate you,” said Iman. Another opinion was delivered by Jerry Kusuma, a freelance designer, “The issue of plagiarism is the issue of conscience, all information gateways are already open, it is now left for us how to define a (so-called) original idea,” said Jeri. Pinkan Victorien (Poystories), a visual jockey who was there as a panelist admitted that she often takes images and videos from the intenet. “But I try to redefine the material to a new one that is completely different from its origin,” said Pinkan. Process of artwork cannibalism and remix is truly unavoidable in this internet era. Phleg, while referring to a film that was also scheduled to play that night, Rip, A Remix Manifesto, believed that the process of remaking and remixing is not taboo. In fact, it is from the collection of past works that these digital artists can make new and better piece of works. Not only interaction between artworks are being ‘stictched’ to new artworks, interaction between designers are considered to be an important influence to a digital artist’s works as well. “Community is important as the place for sharing, and to help us, artists, by providing a supportive ambience,” said Novie Elisa, a VJ who daily works as a scriptwriter in a renown design bureau. 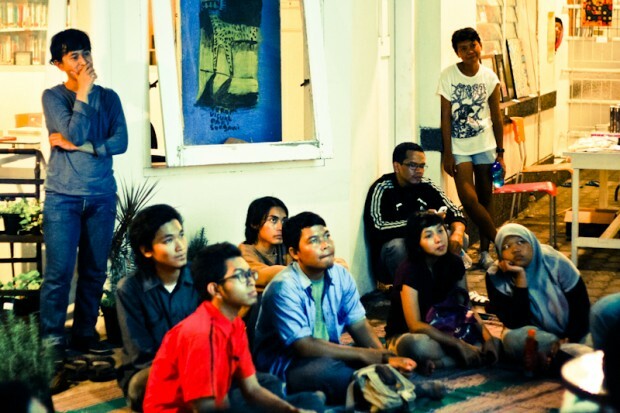 Digital artist community such as WAFT then becomes important considering the few amount of digital based communities that exist in Surabaya. “WAFT doesn’t promise anything but a chance to create, this is a free organization, everyone is free to come and join, from a doctor to a college student,” said Benny. The importance of a community was also voiced by Hendry Wahana from Motion Anthem. “In my work, I always learn from another artists or designers,” said Hendry. Motion Anthem itself was founded by Hendry to accomodate 3D artists but with a more open concept. “We also have illustrators in our team,” said Hendry. As a freelance designer working in a big corporate, Hendry emphasized that the artistic quality in digital art is not always the main factor. “We could have made a better one, but if our client doesn’t like it, then there is nothing that we can do. As far as my experience goes, our corporate clients prefer video that is mind grabbing in the beginning, as it will impress the client,” said Hendry.